Benchrest bullet making differs from other kinds of bullet swaging in one major way: the only performance which matters is the consistency of landing the bullets in as close to the same spot as possible. The match rules and equipment are designed to minimize the human factor, and to reward advances in technical superiority (with limitations established by categories). With other swaged bullets, accuracy is only one of the factors. Even with other forms of target shooting, where accuracy is very important, there are still influences which limit or control the design besides the accuracy factor. In high power rifle competition, for example, the bullet weight and style may be limited to those which function in a service rifle, or which will develop an optimal amount of recoil for prone position shooting. 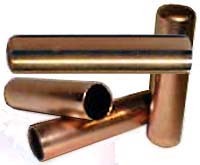 Bullets designed for knocking over metallic silhouettes, simulating a gunfight, or functioning properly in a specific class of gun, have design considerations other than accuracy. 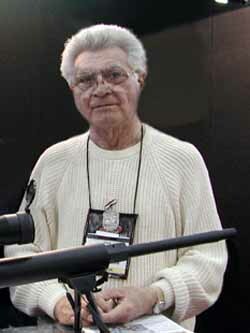 Benchrest is unique in focusing exclusively on accuracy. But in some ways, this tight focus makes design of superior bullets easier. Ultra precision sniper bullets, for example, not only have to be supremely accurate, but must fit a variety of other constraints to do their job properly. Superior varmint hunting bullets not only must be nearly as precise as benchrest bullets, but must also minimize skipping and richochet and blow apart reliably on impact, ruling out any designs that favor penetration or solid construction. Although benchrest bullet design is demanding, it is also less restrictive, because one does not have to balance accuracy with anything else. In nearly any other application, bullet design is a constant struggle to balance conflicting physical properties. Here, one has the luxuary of indulging in a single pursuit. Corbin's benchrest precision reloading press, the CSP-1 S-Press, is ideal for use with either non-threaded benchrest reloading dies or quality 7/8-14 tpi dies. Arbor press anvils, sold in pairs, screw into the floating punch holder (FPH-1-S) and into the ram directly, adapting the press for use with non-threaded dies. Unlike an arbor press, which has only fixed mechanical leverage, the S-Press can be adjusted to use any part of its progressive log-function power stroke by setting the floating punch holder at the desired location. You can adjust the hardened and ground alloy steel ram so it applies pressure at virtually any leverage in the stroke cycle, for the exact degree of "feel" you like. The CSP-1 S-Press is equipped with Torrington needle roller bearings, four sets, in the links, as well as solid bearings surrounding the ram and in the ram to toggle pin. 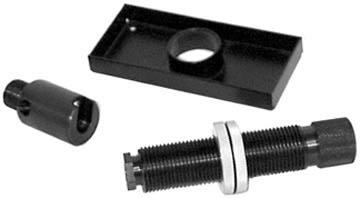 All pivot pins are hardened and ground tool steel. All moving joints run in bearings. 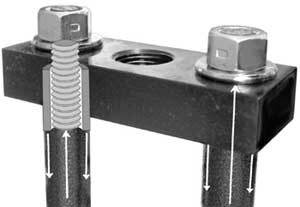 The removable head is kept in perfect alignment by a pair of torsion/compression strut assemblies rather than a simple casting or support rod, as with most other presses. 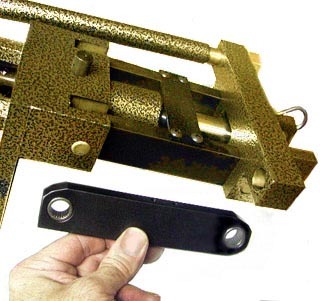 Compare this to any standard reloading press, as well as the precision aligned head and ram (jig bored and assembled from machined steel components, not cast). 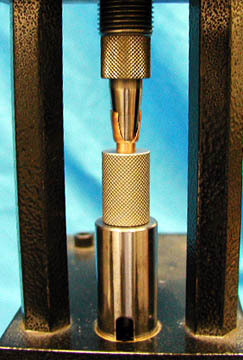 You can easily see that the S-Press is a superior choice for high precision reloading. The same press is ideally suited to manufacturing high precision swaged bullets. The FJFB-3-S die set is a favorite choice. All other things being equal, we recommend the fewest possible steps that will accomplish the job: the fewer steps there are in a process, the less there is to go wrong. 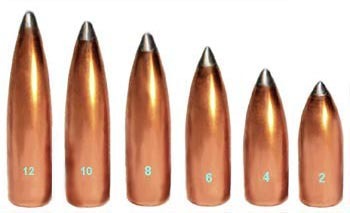 A flat base, open tip bullet requires the least number of operations, compared to lead tip hollow point or rebated boattail bullets. To the right are spitzer (tangential) ogives. Starting at the left, you can see a 12-S, 10-S, 8-S, the standard 6-S, then the 4-S and 2-S ogive curves. (Ogive is from the French for a curve, and is pronounced "OH-jive".) Click on the picture to see a larger one. You may want to print it for future reference. It is seldom you will see identical bullets with only the ogive different for such a broad span (since the purpose of a given caliber usually is aligned with a narrow range of ogives, and is not well served by extremes at the other end of the spectrum). The number refers to the radius of the curve that forms the nose, given in terms of calibers. A 1/2-S curve would make half a circle closing the end of the bullet, since the radius would be exactly half the caliber (any smaller S number is impossible, as it would not make a full nose). The 6-S means we have set our compass points six calibers apart and made the two curves that form the nose, starting tangent or exactly at 0 or 180 degrees compared to the bullet shank. A secant ogive means anything but tangent, so it really does not define so much as eliminate one possibility. If you moved the curve straight back and shifted it over so the shank would intercept it somewhere, at any angle but 0 or 180 degrees, you'd have a secant ogive of some kind. Secant ogives are an attempt to use a more pointed bullet with a higher ogive curve number than would be practical for a tangent junction. You may notice that the difference between the 10-S and the 12-S is minimal compared to the difference between the 2-S and the 4-S. As the curve becomes longer, it overlaps incrementally shorter curves for nearly the whole distance starting at the shank (where all tangent ogives start and thus overlap). Only when you carry the curve out to a smaller and smaller tip do you get significantly longer noses: if you cut the 10-S or the 12-S off just below the lead tip, you could hardly tell them apart. Yet, if you cut the 6-S and the 4-S below the tip, they would still have enough of a different curvature to see a difference. Ultimately, if you kept increasing the ogive curve length, you'd have curves that did not differ enough to matter in the real world, and also lengths of noses that practically stuck out the end of the barrel! The bullet might be very efficient, but it would be too long and hold too much volume of material to be shot from anything but a weird laboratory gun of some sort. So, in practical terms, a 10-S or possibly even a 12-S ogive is about the longest practical tangential ogive nose that gives you a shootable bullet. Even then, you may have such a long bullet that the twist rate of your gun must be increased to stabilize it. When someone talks about a 14-S or an 18-S ogive, they are talking about a secant ogive. And a secant ogive isn't fully described until you also specify one other parameter, specifying in some way the angle of attachment to the shank or the distance that the curve is offset from being tangent. Both figures amount to the same thing, a way to show how much of that long ogive curve is actually being used. Generally, an offset of 0.015 or so from tangent is used, or perhaps an angle of five degrees mates the start of the ogive curve with the parallel shank of the bullet. Knowing this, you can then draw the bullet and see if it is really any longer than a tangent 6-S or 8-S ogive would be. Just specifying the secant ogive radius tells you nothing except that some part of that curve is being used for the nose. Why use a secant ogive at all? The secant ogive lets us fool Mother Nature just a little bit. We can shorten the axial length (linear, down the middle of the bullet) of the nose, so the bullet still fits our gun and still requires normal spin rate, but join the long thin nose to the shank at a slight angle that doesn't generally create a shock wave. If we keep increasing the angle, soon we have a secondary shock wave generated at Mach I (speed of sound) bullet velocity and above, and the advantage of the lower drag co-efficient is lost. One shock wave is bad enough, and you can't design around that...no point designing in a second one to add more effective drag. The problem with shock waves is that they are related to a variable, the speed of sound. This is not a constant value, but varies with effective air density (which also varies with moisture and barometric pressure). So, if you push the secant ogive bullet design to the edge on a good day, it may work fine, but as soon as the weather changes, the bullet follows a different trajectory because it now generates that secondary shock wave that was absent before, and the BC drops as a result. As you may know, if you have a vast number of bullets of all calibers and shapes and weights, but they all happen to have the same BC, then firing them all at the same initial velocity will result in them all following exactly the same trajectory. A .17 caliber and a .50 caliber will follow the same trajectory if they have the same BC. It's the meaning of BC, the relative rate of retardation compared to some standard bullet. But having delved into this aspect of bullet design, it's time for a reality check. When the only consideration is accuracy, issues such as the BC are secondary. There is an unfortunate tendancy among shooters who do not have a physics or engineering background to equate the ballistic coefficient with the accuracy of a bullet. That is, a high BC is sometimes thought to be necessary for one hole groups. Ballistic coefficient is primarily a comparison of the drag or rate of velocity loss of a given bullet with some other bullet that is selected as a standard or 1.0 on the graph. It has no meaning in absolute terms. To say that one bullet has a BC of .830 and another has a BC of .345 only has meaning if we are absolutely certain that both bullets were compared to the same standard. This is not always the case, since the number has become popularized beyond its strictly mathematical usefulness and is now used as a marketing tool. Assuming that the standard bullet is specified, then a comparison of BC values for two bullets would have meaning. It indicates how closely the samples perform in overcoming air resistance (usually compared to a 1-inch boattailed spitzer artillery projectile). All other things being equal, a higher BC is desirable, but not at the expense of accuracy. The BC is determined by multiplying a coefficient called the "Ingall's number", which represents the inverse drag of the air upon the bullet, times the mass divided by the square of the diameter. Use a high density material, such as gold, tungsten, iridium, or osmium. High density puts more weight into a smaller package, so that the mass is increased for a given diameter without making the length excessive. This has the disadvantage of increasing bullet cost. Powdered metals can be compressed with normal swaging pressures, but have lower density than solid or sintered metal. Osmium, which vies with iridium as the heaviest stable metal, can produce deadly fumes under certain conditions. Gold and iridium are safe to use but rather costly. EZ-Flo Micro-Fine Tungsten powder is available from Corbin in 7,000 grain, 35,000 grain, and 70,000 grain flasks as well as by 50-kg pail, and is used by a number of custom bullet firms and government groups. Make the bullet longer for a given diameter. This adds mass, but has the negative effect of requiring faster spin rate to keep the bullet pointed nose first. More spin amplifies any imbalances in the bullet radial parameters, such as slight differences in jacket wall thickness. Accuracy can become far worse from either high required spin rate, or from a bullet becoming too long for the barrel twist and thus unstable. High BC can in this case lead to less accuracy. Reduce the included angle of the shock wave for bullets traveling above Mach I (the speed of sound) by making the ogive more sharply pointed, and reduce the turbulence at the bullet base by using a rebated boattail (which avoids generating a ball of gas through which the bullet must travel, like a conventional boattail). A longer nose requires a higher minimum weight, and a longer counter-balancing shank, so that as the ogive becomes more and more pointed, the bullet becomes longer and longer, and eventually the required spin rate to stabilize it becomes excessive. In a single shot bolt action rifle, the physical length of the bullet nose isn't a factor in functioning of the gun (assuming the chamber and leade were designed with the long bullet in mind). But spin rate puts a limit on practical ogive length. Typically, benchrest bullets for under 200 yard shooting don't need to exaggerate the BC, and can gain more by using the lowest practical spin rate. Therefore, a 6-S ogive would be entirely practical. Many clients choose a 7-S custom ogive, or the 8-S ogive. A few choose the ULD (Ultra Low Drag, developed by Corbin for military and Treasury department sniper applications many years before the very similar VLD popular with civilians). But even though the ULD is our design, we feel strongly that it is not appropriate for medium and short range (100-300 yard) target shooting simply because it forces the shooter to use a longer bullet than necessary, which in turn requires a faster twist barrel, which in turn exaggerates any jacket wall eccentricity. So why do it? Who cares about the BC, if you are not shooting in a gale wind, at 100-300 yards? If you can read the mirage and the wind flags like a high power shooter, then you can certainly take advantage of the slower spin that stabilizes a normal weight 6-S bullet. But the ULD design will help at 500-1000 yards (and of course, with 50 caliber benchrest at 1000-2000 yards, it will become a necessity as soon as enough other good shooters catch on). At some point, the bad effect of more spin balances the bad effect of wind drift on a lower BC bullet, and you choose the lesser of the two evils. This is no different from other bullet design fields, where you are always choosing between two contradictory values and trying to balance their bad effects in order to get the most use from their good effects. No serious benchrester should consider using an over-the-counter, mass produced reloading press or the kind of dies that only work with it. 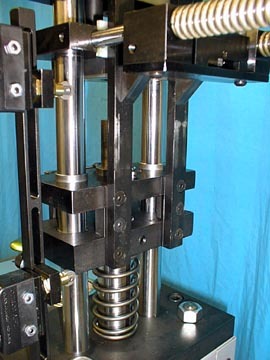 The high precision S-Press works with type -S Corbin dies, which are self-ejecting on the down stroke, and use a CNC-type floating alignment punch holder in the press head. RBT-2 is a two die set but it is never used alone. It is simply a set of dies that can be added to any flat base die set, in order to add the capability for making rebated boattail bases. If you already have a flat base die set, get the RBT-2 set and you have both flat and rbt base bullet making capability. FJFB-3 is a three die set, with a CSW-1, a CS-1, and a PF-1 added. It can do anything the previous two dies can do, and in addition, it can make smooth ogive bullets without a step shoulder. Standard rifle shapes are 6-S for .358 and below, 4-S for .366 and above, 1-E for rifle shapes having round nose designation except for 600 and 700 Nitro which use 1/2-E blunt round nose. Standard pistol shapes are 3/4-E for round nose and TC for truncated conical shape. Other shapes can be made to custom order. LTFB-4 is a four die set, with a CSW-1, a CS-1, a PF-1 and a LT-1 lead tip die added. This set makes everything the previous three can make, plus nice lead tip bullets. The FJFB-3 die set can be used for lead tips if the tip is round or blunt or hollow pointed: this set is best used when you need a sharp or radiused small nose on the lead tip bullet. RBTO-4 is a four die set, with a CSW-1, the RBT-2 die set, and the PF-1 point former. It makes rebated boattail bullets in open tip or blunt lead tip styles. The CS-1 core seater is replaced by the two-step RBT operation, using those two dies to form the rebate boattail and seat the lead core. RBTL-5 is a five die set, which simply adds a LT-1 to the previous die set (RBTO-4) so you can make both good open tip bullets and good lead tip bullets, at your option. All of them will have rebated boattail bases. FRBO-5 is a five die set, which simply adds a CS-1 core seater to the RBTO-4 set, so you have the ability to make flat base bullets by setting aside the RBT-2 dies and using the CS-1 instead, or making rebated boattail bullets by setting aside the CS-1 die. All of these would be best with open tips, hollow points, or at most a blunt or rounded lead tip. FRBL-6 is a six die set, with all the various dies included. You can make open tip flat base bullets using the CSW-1, CS-1, and PF-1 dies. You can make lead tip flat base bullets with the CSW-1, CS-1, PF-1 and LT-1 dies. You can make rebated boattail open tip using the CSW-1, RBT-2, and PF-1 dies, and rebated boattail lead tip bullets by following with the LT-1 die. Using a good press and high quality swaging dies means nothing unless you have the highest quality of bullet jacket. Corbin VB (Versatile Benchrest) bullet jackets are drawn with a thin, parallel front third, which allows you to use the same diameter of core seating punch for a wide range of bullet weights. But they also use a heavy base and rear shank section to prevent damage from the "crunch" that occurs when the powder charge ignites, shoving against the inertial resistance of the bullet in the first milliseconds after ignition. The jackets were brittle, unannealed. They had a tendancy to fold at the nose, and to crack at the base when used with a rebated boattail. The jackets were thin, and sometimes made of different alloys such as 10-90 commercial bronze (not really a bronze, but that's the trade term for this brass alloy), so that they were really unsuitable for anything other than target or varmint shooting. It is costly to stock bullet jackets, they have very thin margins of profit (if any), and so it would be nice to use the same high quality benchrest jacket in making top grade hunting bullets. The supply was erratic and the price seldom stayed the same on two consecutive orders. And eventually, the quality became erratic as well. Since we were making nearly all the precision bullet jacket drawing dies and equipment that are used in 22 countries in the custom bullet market, it was always on the agenda to offer our own brand, in a state of the art design. Jackets remain very costly to stock, because the up-front investment is hard to recover in a reasonable amount of time, and jackets are rather price inflexible: charge what they are really worth based on production costs, and people tend to just buy bullets instead. But in spite of this, it became apparent that Corbin needed to offer a jacket that met all the above objections and solved those problems. Corbin now offers the Versatile Benchrest(tm) bullet jacket, in a growing list of diameters and lengths. Our strategy has been to stock either the most popular (based on our sales history) length in each caliber, or the longest popular length and then offer the Corbin ET-1 and ET-2 jacket trim dies so you can make ANY length, at will, whenever you want it. There isn't any practical way to offer all the lengths in all the calibers, from stock...better we should be around to offer a good solution, than to go broke trying to offer an impractically expensive solution. The specifications for Corbin VB jackets in 224, 243, and 308 will change as the demand changes over the years, of course. But it is practical to use the .224 with a Corbin JRD-1-S precision jacket reducing die, and a Corbin ET-2-S jacket trim die, to make nearly perfect .20 (5mm), .17, .14, and .12 caliber jackets. With the 1.23-inch long .243, you can make long heavy jackets for .224, as well as the unusual .228 and .230's. The 1.25-inch long .308 will draw down and trim to make .284, .277, .264, and .257 jackets of nearly any desired length. If the final length is considerably less than the starting length of the original diameter jacket, it is wise to use an ET-1 trim die to pre-trim the original jacket before drawing. 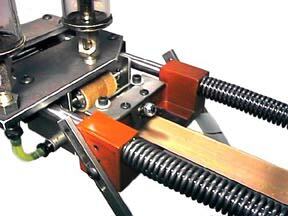 Jacket draw dies take a caliber down in diameter while making it longer. The jacket walls thicken at the base, because the heavier base material is drawn up into the shank. A given jacket drawing die only works with one specific diameter, because it is made with a "nest" that accepts that diameter prior to drawing, in order to maintain concentricity of the walls. You should not push a 7mm jacket down to .264 with a .308 to .264 draw die. 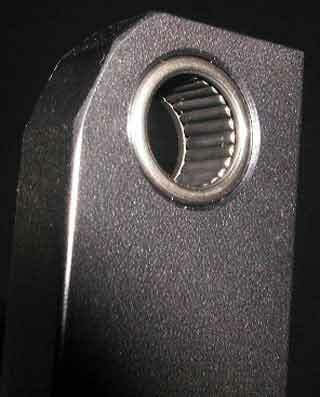 The ET-2-S die is an automatic ejecting jacket trim die where the jacket is trimmed with a die that fits the ram, similar to a bullet swage die. A fat, tapered punch pushes the jacket into the die, spreading and splitting the part to be trimmed off against the die mouth. This kind of die is quick to operate. 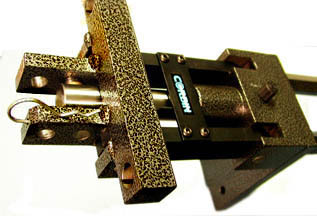 It does not completely cut off the expanded and scored "scrap" portion, but leaves a thin web to cushion the cutting edge of the die from the hardened punch. You can remove the trimmed portion by tumbling, or twisting gently with the fingers or a needle-nosed plier. A trim die makes it possible to stock one length of jacket and make a series of other lengths from it any time you need them. Bullet jackets need to have wall concentricity better than .0002 inches in order to be considered benchrest quality. Corbin VB jackets not only meet the requirement for world-class benchrest matches, but have a thick enough base and rear shank to be good hunting bullets (especially with Corbin Core Bond). They are available in packages of 250 and 500 (depending on caliber), with discounts available in carton quantities (see price list or webstore at www.SwageDies.com). Corbin jackets are annealed to reduce the tendancy to crack when brought to a sharp point or rebated base, and built with a thin parallel mouth section to fit a single diameter core seating punch perfectly with a wide range of weights. Today, the state of the art is the VB jacket.